A little-known fact about business contracts: Contract mismanagement costs companies millions of dollars on an annual basis. This is primarily due to the widespread indifference to contract management; most companies simply negotiate, sign, and toss a contract into a file folder. This careless approach to these important documents results in enterprises needlessly losing substantial amounts of money. According to the Gartner Group, 60% of all supplier contracts are automatically renewed without the knowledge of the buyer, due largely to the buyer failing to give a notice of termination. Even more amazing is that 50% of contracts self-renew on multiple occasions without the buyer’s knowledge. The laissez-faire attitude towards contract management can have severe financial repercussions, as auto-renewals frequently include more costly terms and late terminations may be subject to litigation and damages. Contracts are far from being static “sign-and-forget” documents; in fact, they are organic documents subject to real-world events. Actions taken by involved parties may trigger contractual terms and parties may need to fulfill requirements based on specified dates. The best way to manage these organic documents is to use a software platform that facilitates and addresses the entire contractual lifecycle. •	Content Capture and Tracking: Centralization of contractual documentation is critical in keeping track of legal obligations, both for yourself and other parties. This means digitization of the contracts, specifying all contact details, and including all data in an accessible repository. Next, notification-based tracking mechanisms need to be established in order to monitor critical contract milestones — all date-based elements need to be tracked and subject to alert triggers, such as obligations, renewal dates, expiration dates, and benchmark/milestone expectations. •	Automating Future Contracts: More than likely this isn’t the first time you’ll need to create or manage a contract. The earlier you establish a contract creation mechanism, the more expedient and efficient future contracts will be. Selectable contract templates and clause libraries will make future contract creation much more manageable. 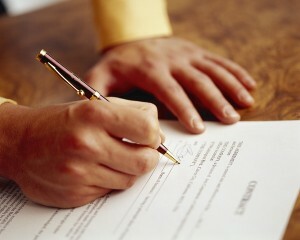 The use of form-guided templates, when done correctly, empowers business users to quickly create their own contracts. The management of this can then be facilitated by a communication solution, such as a ticket-based Help Desk system. •	Negotiation, Approval, and Finalization: The human element of contract building involves negotiating terms and seeking approvals from all parties. This process can quickly get out-of-hand as stakeholders insist on interjecting their own clauses or modifying existing content — the editing process can go back-and-forth, making finalization a difficult goal unless communication and tracking mechanisms are established. Finalized contracts need to be carefully stored (digitally) and should be accessible to all relevant parties. •	Scalability: The process of creating, negotiating, and finalizing a contract can be a laborious one; as the saying goes, there are “a lot of moving pieces.” If you are in a large enterprise, then this process may have to be repeated hundreds (if not thousands) of times. Meticulous contract management processes need to be established and automated as much as possible. •	Renewals and Extensions: The signing of a contract is rarely the final event in that contract’s lifecycle. Many contracts types, such as support contracts, warranties, and leases have renewal dates. The responsible parties need to be notified of pending renewal in order to take action. This may involve approvals or renegotiations. Other contracts may require extensions. Once the original contract is in place, the parties may want to extend or otherwise modify the contract and this requires further negotiations. Microsoft SharePoint is a robust platform that enables companies to centralize their communication and collaboration efforts. SharePoint by itself is powerful but can be made even more so when bolstered by enhancements and enrichment provided by a leading SharePoint development company such as us here at Crow Canyon. With this extra horsepower, SharePoint can be used to streamline business processes that typically consume significant time and effort, helping organizations run more smoothly and effectively. Contract management, given the high level of interaction and the complexity involved, is an obvious choice to benefit from communication platforms such as SharePoint. Having developed Help Desk, Asset Management, and a host of other business applications on SharePoint, it was a natural fit to turn our attention to Contract Management. Click to view more information on our SharePoint-based Contract Management system. With the manifold risks of contract mismanagement, implementing a Contract Management system in SharePoint can have immediate benefits to any organization. The system can be as simple or as complex as needed — some may want to use the system only for reminders and alerts on contract renewals; others will want to track and manage the full contract lifestyle. Whatever the case, SharePoint, with the added functionality of a system like Crow Canyon’s, is an ideal solution to meet the contract management needs of just about any organization.